An outbreak of swine flu has been reported at Mater Dei Hospital and St Vincent de Paul Residence, Times of Malta has learnt. All corridors at Mater Dei are being taken up. Read: Swine flu outbreak - what happens now? Sources said more than 30 patients were being treated for the potentially deadly H1N1 strain of influenza, more commonly known as the swine flu. 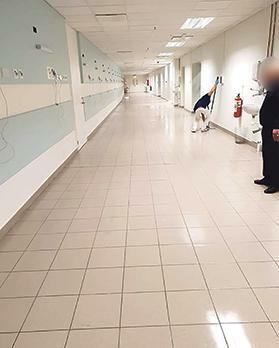 Overcrowding at both the hospital and the home for the elderly in Luqa was acting as a catalyst for the strain to spread, even with a simple sneeze, the sources added. They said there were at least 18 patients from St Vincent de Paul who were suffering from the highly-contagious influenza. A further 15 new cases were reported at Mater Dei on Thursday morning, Times of Malta was told, with the numbers expected to increase in the coming days. According to the sources, the first patients to be diagnosed with the swine flu came from the home for the elderly and, within days, a number of other patients were diagnosed at Mater Dei. The sources said efforts were under way to contain the outbreak by cordoning off areas where the swine flu patients were being treated. The hospital management vacated the endoscopy unit to use the space as a quarantine zone for swine flu patients, they added. However, they remarked, this was no easy feat because there were no empty beds at Mater Dei since the hospital was also dealing with an influx of patients suffering from bouts of the seasonal influenza. “We have simply run out of beds and we are leaving patients on stretchers now. To make matters worse, we are also running out of space, so all corridors are being taken up,” the sources said. When contacted, a spokeswoman for the Health Ministry said: “From the hundreds of samples analysed for the influenza virus, there were no cases of H5, that is bird flu. There are no cases of patients at Mater Dei Hospital who resulted positive to H5. Influenza cases for this season were influenza type A subtypes H1N1 and H3,” she noted. No reply was forthcoming when the spokeswoman was asked to specify how many patients had been diagnosed and what precautions were being taken at hospital. A spokeswoman for the Family Ministry, which is responsible for the homes for the elderly, said the cases at St Vincent de Paul were “epidemiological strains of seasonal influenza as those in the rest of the Maltese islands and the rest of Europe”. In a statement on Friday, the Health Ministry said the influenza A (H1N1) virus, which emerged in 2009, was more of a threat then as it was a new virus and people had not been previously exposed to such a strain. Since then, it became the predominant circulating strain in many European countries for seasonal influenza. Since “herd immunity” for H1N1 in the community was high across Europe, the risk of a pandemic was now very much reduced. The strain H1N1 was also included in this year’s seasonal influenza vaccine offering protection to those vaccinated. Up to now 85,687 persons took up the vaccine, which is still available for free in all health centres. Patients with H1N1 currently at Mater Dei contracted the virus from the community and were admitted to hospital for the management of respiratory complications, the ministry said.